Based on our years of experience and research on various popular theories and principles of Law of Attraction, we have devised the following framework to attract money which we have named as ‘Money Chalisa’. Money Chalisa is based on the following 8 Magical Principles. These form the soil on which we should sow the seeds of Money Chalisa techniques to harvest our crop of Wealth and Abundance. All the techniques discussed in Money Chalisa have their roots in a fertile soil collectively formed by these 8 Magic Principles. Even if one of these is missing, seeds do not germinate – that is to say, Money Chalisa techniques are unable to bring results. • Money is multiplying and coming back to me. 2. Ward off Negative Influences: Even a small negative thought or influence nullifies the positive energy created by positive affirmations. So steer clear of any discussions, news or thoughts that are related to financial trouble, scarcity and struggle. Spend time reading, watching, thinking and talking about abundance and prosperity. • Promotions, Salary hike etc. 4. Take Actions: Simple changes in the way you manage your money can bring big results. For example, keep your money well arranged in your wallet; count your money frequently; keep some money around you; and on top of all, keep it safe. You will wonder what effect does this have – it makes money feel respected and welcome. Only when someone feels welcome, they come to us! Money Chalisa Workshop looks at each of these techniques in depth and provides step-by-step instructions and methods on how to follow them in your during daily routine. The soil (principles) and the seeds (techniques) have to be nurtured through persistent, honest and dedicated efforts to reinforce them and reap their best benefits. Apart from building upon the techniques of positive affirmation and visualization, Money Chalisa also puts forth successful tips and tricks for managing personal finances. 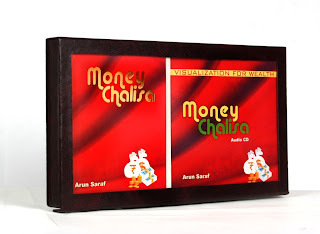 By harnessing mind techniques of positive affirmation and visualization with practical money management tips, Hope Academy has gifted to the mankind, Money Chalisa, which is not just a one-time read but a proven formula for leading a rich life. Its forty recitals are distilled from many years of experience of industry expert, Arun Saraf and scientific principles of Law of Attraction and power of subconscious mind. Alter your thoughts to alter your destiny!